Annie knows Pike Place Market pretty well. In 1972, you could catch her at one of the crafts tables at Pike Place Market. She was rocking a polyester double-knit suit, selling copper bracelets and cotton drawstring pants. For 12 years, Annie sold her pieces at the Market and became an integral part of the craft community before moving to West Seattle for an office job in 1984. But when Annie returned to the Market in 2008, it wasn’t to come back to her craft table; it was to establish a new life. Annie had experienced a sudden and unexpected fall into homelessness before moving into the Market as a resident in the historic building just behind the iconic neon clock and sign. 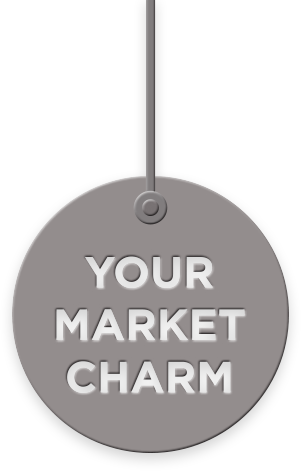 Initially, she had a difficult time leaving her apartment and re-engaging with the Market community. “I just felt so ashamed. No one in my family had ever wound up homeless… So there was that shame factor. I thought, ‘Oh I’m safe here, I’m just going to stay right here,’” said Annie. 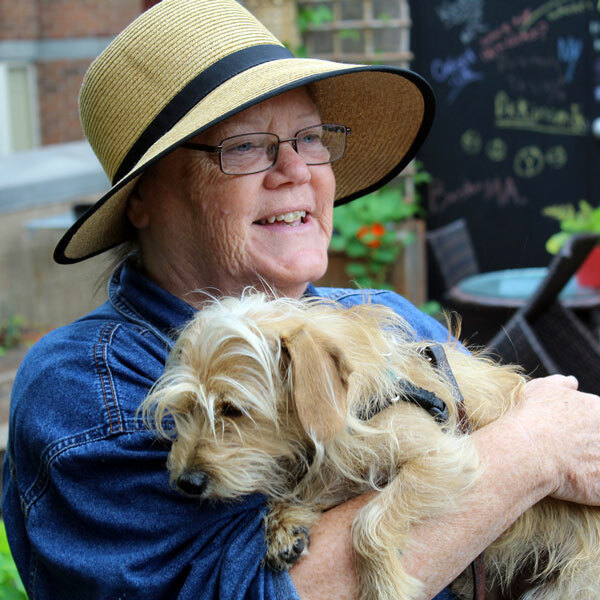 With the help of her service dog, Annie started to venture outside again and interact with the Market community. She was rewarded with a welcoming neighborhood of new and old faces. 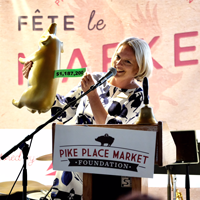 While she lamented seeing older Pike Place Market businesses from her youth start to retire, she also noticed the new shops and social services sprouting up in today’s Market. 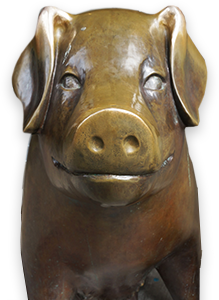 Now, Annie is one of our most active Market community members! She’s grateful for the nearby Neighborcare Health Clinic, which provides her with proper care and prescriptions to maintain her good health. She attends exercise classes in the Pike Market Senior Center and stops by the Food Bank every week. 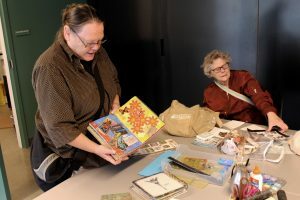 She always looks for opportunities to engage with neighbors through attending coffee hours and leading a crafting and collaging class every month at The Market Commons. But it’s the Pike Place Secret Garden where Annie has had the biggest impact, being in charge of growing and harvesting vegetables. Her green thumb has grown snow peas, eggplant, romaine lettuce, and so much more. 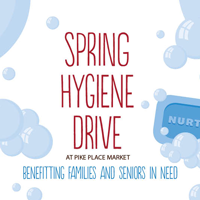 With the help of The Market Commons, she’s extending the opportunity to grow crops in the garden to the Pike Market Preschool and the Heritage House! She helps provide garden beds where excited preschoolers can watch seeds grow, and is giving guidance to an upcoming Garden Club to get seniors outside to the garden. Whenever Annie talks about the Secret Garden, you can see her light up. “Today the Delta volunteers came and they put in all those seeds, and now you have to wait. Are they gonna pop? – They will eventually, and it’s silly, it’s so thrilling….I’m just shocked that this little piece of dirt can have this green thing sprouting out. 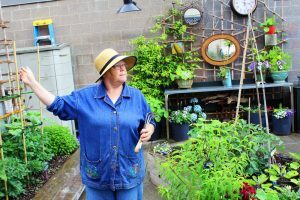 I just love the garden up there.” The Secret Garden produces about 500 pounds of vegetables a year, and it all goes back to the Pike Market Food Bank to help residents just like Annie. 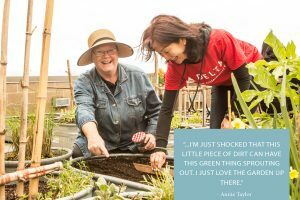 We’re thrilled to hear the stories of people like Annie, who return home and give back to nurture the Market community. Annie smiles, “I get this second chance of having a good life.” Thank You Annie!